Last night we popped along to the Magnificent Mughals: Arabesque and Geometry course at The Prince’s School of Traditional Arts with Amber Khokhar. It was fantastic to see some of the work being produced. 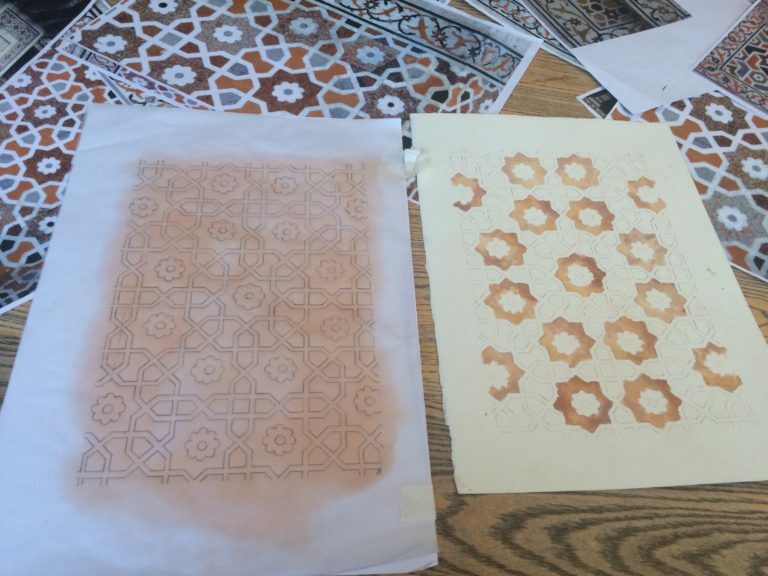 Students used the beautiful designs from the Itmad-ud-Daulah mausoleum in Agra for inspiration to create their patterns which combined geometry and arabesque. Amber chose this mausoleum, commissioned by a daughter to commemorate her father and the very first tomb in India that is entirely made out of Marble, for its combination of both simplicity and complexity as it well as it modern aesthetic. The attendees were encouraged to use mathematical equipment to create their compositions and one began to add the Mughal inspired paired down colours to their work. The Bagri Foundation was delighted to support this course to promote Asian art at The School.